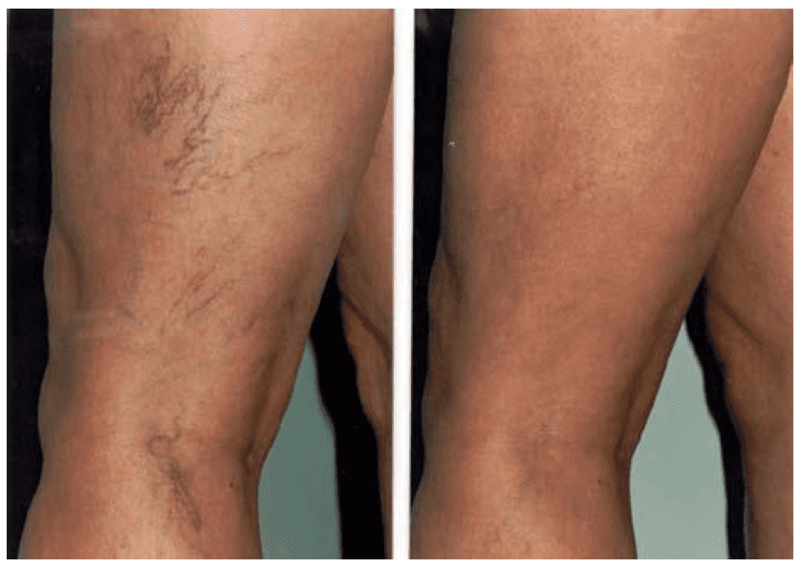 Ageless Aesthetics in Women’s Health Warner Robins and Women’s Health Institute of Macon offers effective treatments for spider veins and varicose veins. Our team is highly experienced and trained to perform a range of vein procedures. Whether you are looking to alleviate pain or simply clear your skin, we provide patients with state-of-the-art medical facilities in a spa like environment. Spider veins are superficial and therefore procedures that address them are considered cosmetic. They discolor the skin and show up as thin red or blue lines. They can appear on the legs, face, and body. We use sclerotherapy and laser treatments to reduce the appearance of veins. Because these are cosmetic procedures they are not covered by health insurance, but our convenient patient financing is available. Treatments for varicose veins, however, are more extensive. They appear when blood is poorly circulated throughout the body, especially the lower legs. This results in pain, fatigue, and heaviness. Our offices employ endovenous laser ablation (EVLA) as an alternative to stripping. We can also work with your health insurance to see if therapy can be covered. Varicose veins are fairly common, and typically under diagnosed and under treated. Varicose Veins can get worse without care and proper treatments. Varicose veins tend to be more common in the legs because while standing and sitting gravity increases the pressure on the superficial veins. One of the reasons vein disease is under diagnosed is the vague nature of its symptoms. Symptoms for varicose veins can include swelling, pain, cramping, heaviness, fatigue, itching, restless leg syndrome, and burning. In severe cases, varicose veins may cause skin changes, ankle discoloration, and skin ulcerations. Sclerotherapy: Small injections of medication shrink and dissolve fine purple-colored spider veins and small varicose veins. This procedure is safe and effective with little or no pain or downtime. Radiofrequency therapy for venous reflux: Venous reflux causes varicose veins that can be swollen, itchy and painful. Through a minimally-invasive procedure, a tiny catheter powered by radiofrequency energy delivers controlled heat to the vein wall, causing the vein to close. This outpatient procedure treats the underlying cause of varicose veins with little or no pain.